The flood of reports coming in from the past month or so have really increased my excitement for the upcoming Mobile World Congress in Barcelona. One particular smartphone that’s received a lot of attention is Nokia 9 PureView, which is said to feature an interesting penta-camera setup the back. Now thanks to NokiaPowerUser we have access to the first real-life images of the smartphone. The first image shows the Nokia 9 PureView sporting a tall display, with a slightly thick border on the top and bottom (especially from the 2019 standards). 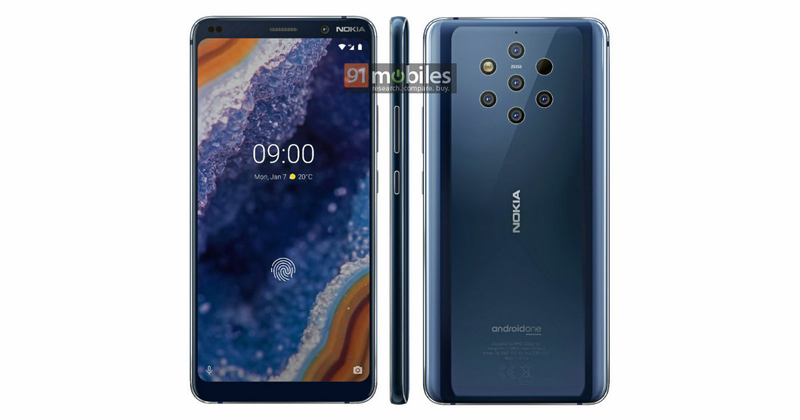 The bezels above the display also features a pair of sensors on the left side and a selfie lens on the right, along with the Nokia branding. The image is in line with the recent press render that we published earlier this week. The second picture shows the five-sensor camera and LED flash as well as the glass back of the handset. Conspicuous by its absence is the Zeiss and Android One branding, which we have seen in previous renders. There’s no visible fingerprint reader on the phone, which suggests the inclusion of an in-display fingerprint sensor. According to the rumour mill, Nokia 9 PureView will feature a 5.99-inch AMOLED display with full-HD+ resolution and HDR10 support. Apart from this Nokia 9 is believed to be powered by the previous generation Snapdragon 845 processor along with 6GB/8GB of RAM and 128GB/256GB of in-built storage. Reports have suggested that it will pack a 4,150mAh battery along with fast charging and wireless charging support. In addition to Nokia 9, HMD Global is also expected to launch the Nokia 6.2 (2019) at this year’s MWC.